View from the east of Alnwick abbey, founded in 1747 by Eustace FitzJohn. The abbey once held two major relics: the chalice of Thomas of Canterbury and the toe of Simon de Montfort. 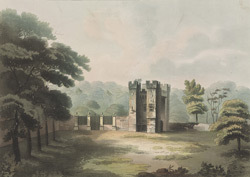 By the 18th century, as can be seen from the print, the building left was the square-turreted and crenellated gatehouse, which dated from the 15th century.